Sunncamp Motor Buddy Drive Away Campervan Awning - Simple and practical, ideal as a walk through entrance, or as a handy storage annexe. Sunncamp's Motor Buddy provides the extra space required for short and long term holidays. 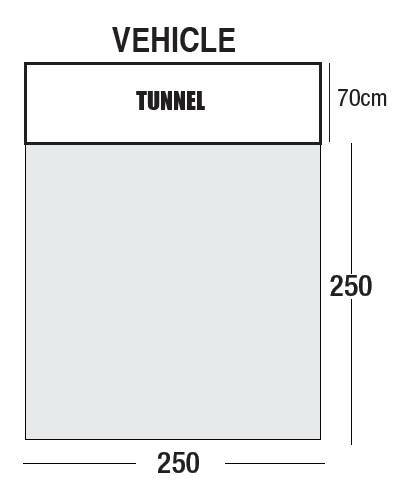 Attachment is via the rear tunnel that fits vehicles 210cm - 245cm. Waterproofing - 6000 H/H - for maximum protection. Flysheet Material - 150D Oxford Polyester. Roof Material - 150D Oxford Polyester. Pack size - 74 x 17 x 17 cm. Side panels included half window half mesh ventilation. Seams Heat sealed - for maximum protection. Mudwall Weathershield peg-able external mud wall. Figure of 8 fixing Included.